One of the most luxurious and noble ingredients in the art and history of perfumery, rose is an ode to femininity. The Rose Layering Oil is a feminine explosion of deep rose notes - rose oil and rose absolute. In harmony, this precious oil unveils a floral, rosy, sparkling fresh and fruity leaving an elegant trail. 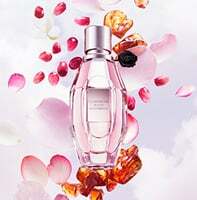 The Rose Twist boosts the rose note of the Flowerbomb Eau de Parfum and evokes feelings of elegance and femininity. The ultimate queen of perfumery, the rose, beckons to your inner goddess. One of the most luxurious and noble ingredients in the art and history of perfumery, rose is an ode to femininity. The Rose Layering Oil is a feminine explosion of deep rose notes - rose oil and rose absolute. In harmony, this precious oil unveils a floral, rosy, sparkling fresh and fruity leaving an elegant trail. As Viktor&Rolf continue to challenge convention and push olfactory boundaries, they extract freshness from the iconic floral bouquet at the heart of their original fragrance. In their newest innovation, they reintroduce a timeless ritual – layer oils – as a luxurious base to be complemented by Flowerbomb eau de Parfum. When blending Flowerbomb Twist and Flowerbomb Eau de Parfum, one creates a personalized ritual, creating a deeply impactful and memorable trail. Flowerbomb Rose Twist Layering Oil is rated 4.0 out of 5 by 3. Rated 5 out of 5 by MrsFYI from It’s a LAYERING oil I love this idea! It smells beautiful and makes it so much nicer. ***If you’re wondering why this doesn’t smell so strong (or as strong as the perfume), it’s because THIS OIL IS DESIGNED TO BE *LAYERED* WITH THE PERFUME for added focus on that scent. *** I like the Rose and Jasmine, but I’m not crazy about the Musk, but that’s just not my thing. These are so nice because I like the perfume by itself, but my favorite flower scents stand out more with the oil. And remember my friends... If something isn’t right about a product, try reading the info on the box. Rated 4 out of 5 by Joycemc from Weak when use alone I was planning to use the oil alone as a pure rosy fragrance. But the rose fragrance was very weak. Maybe it'll be more strong when combined with the perfume.